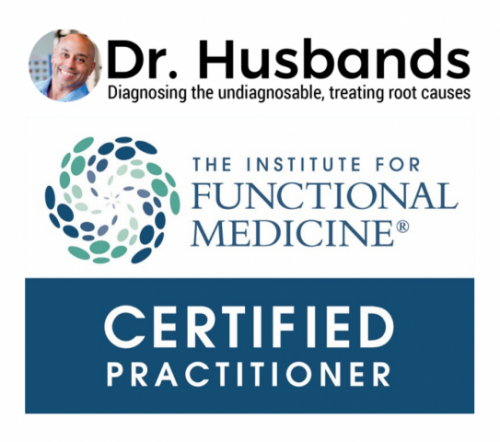 The Institute for Functional Medicine announces Dr. Douglas Husbands as an IFM Certified Practitioner, joining the elite group of approximately 600 practitioners worldwide who are trained to identify and treat root causes of chronic disease. November 8, 2018 Federal Way, WA – The Institute for Functional Medicine (IFM), the global leader in Functional Medicine, is pleased to announce Dr. Douglas Husbands as an IFM Certified Practitioner. As an IFM Certified Practitioner of The Institute for Functional Medicine’s Certification Program (IFMCP), Dr. Husbands is uniquely trained in the Functional Medicine model to identify and treat the root causes of chronic disease. In order to achieve the designation of IFM Certified Practitioner, Dr. Husbands has completed seven training seminars and passed stringent written and case study evaluations. Of total healthcare costs in the United States, more than 75% are due to chronic conditions. The current healthcare system is designed to treat urgent medical problems, also known as “acute” conditions. However, chronic, lifestyle-related diseases cannot be treated successfully using the same approach. What works is an individualized approach to patients—with an emphasis on the ways our environment and lifestyle choices interact with our genes. Functional Medicine is an innovative approach to medical care. It uses the latest medical research to develop personalized care for each patient, based on his or her unique environment, lifestyle, and genes. The result is a dynamic, effective way to address chronic disease. Dr. Husbands joins an elite group of approximately 600 practitioners who are certified through IFM’s Certification Program. About The Institute for Functional Medicine (IFM): IFM is the global leader in Functional Medicine. The mission of IFM is to serve the highest expression of individual health through the widespread adoption of Functional Medicine as the standard of care. Functional Medicine is a personalized, systems-oriented model that empowers patients and practitioners to achieve the highest expression of health by working in collaboration to address the underlying causes of disease. The primary drivers of the chronic disease epidemic are the daily interactions among an individual’s genetics, environment, and lifestyle choices. Functional Medicine addresses these underlying causes of disease and equips healthcare practitioners to help their patients manage this complex, interconnected web. For more information about IFM, please visit IFM.org.